Did you get an Instant Pot for Christmas? I actually got mine a couple of weeks before the holiday and after staring at the box for several weeks, I finally put it to work. I have to add my voice to the crowd of IP fanatics and say that I’m loving it! I’ve had many crazy busy days recently and it has allowed me to create some really tasty dinners I’d have never been able to pull off otherwise. After several weeks of research and recipe testing I’m happy to be sharing my very first Instant Pot recipe with you today! I’ve written a separate post detailing the information I’ve absorbed over the past several weeks. 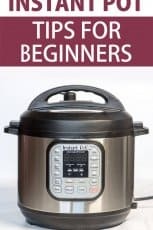 Hop on over to Instant Pot Tips for Beginners for a condensed set of basics to help you get started. I’ve discovered through trial and error that some recipes make more sense than others to be prepared with the pressure cooking method. One of the most exciting results for me was cooking dry beans. I was stunned at how quickly they became tender, with just the perfect bite. And, it is so easy! 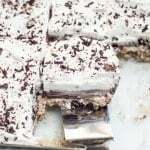 This recipe has been tested three times with a wonderful result each time. No matter what method you use to cook dry beans, I recommend soaking them overnight or for at least 6 hours prior to cooking. I use my Instant Pot insert and cover the beans by at least a couple of inches with cool water. After soaking, pour off the water and rinse them well with fresh, cool water. 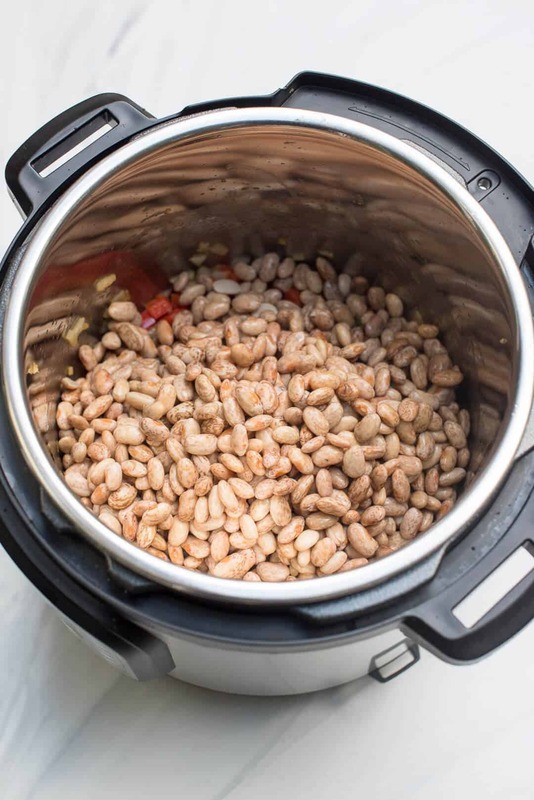 Even though the Instant Pot is capable of adequately softening the beans without this step, there are more reasons to soak beans besides ensuring a tender result. The soaking process will remove any dirt or debris and begin to break down the sugars on the outer surface of the beans. This makes them more easily digestible and is believed to aid in your body’s ability to absorb the nutrients. The first step is to sauté the onion, bell pepper, jalapeno and garlic in some vegetable oil. Next, in go the dry pinto beans that have been soaked, rinsed, and drained. Important note – don’t be tempted to double this recipe. You should never fill your Instant Pot more than half way when cooking items that expand, like dry beans. The remaining ingredients are added to the Instant Pot. Chicken or vegetable broth, tomato sauce, yellow mustard, chili powder, cumin, oregano, fresh ground black pepper, and a couple of bay leaves. That’s it! Give it a stir, lock the lid in place and set it to MANUAL for 25 minutes. Kitchen Tip – When calculating the total time it will take to prepare an Instant Pot recipe, you’ll need to include the time it takes for the Instant Pot to pressurize, typically 10 to 15 minutes, and for the natural release period after cooking which can take from 10 to 20 minutes. I was going for saucy beans but if you’d like a thicker consistency it’s easy to control the texture by modifying the amount of liquid added. See the Notes section on the recipe card below for more information. 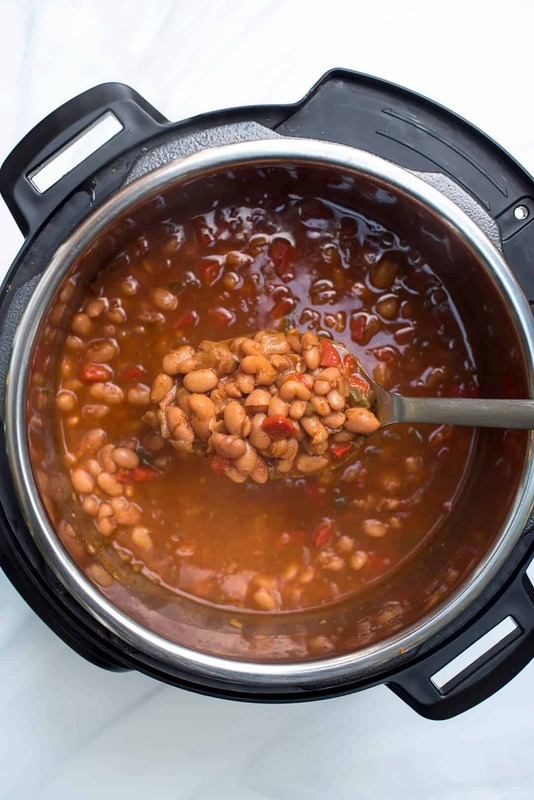 Place beans in the Instant Pot insert and add enough water to cover by 2" to 3". Allow to soak overnight or for at least 6 hours. After the soaking time, drain off and discard the soaking water and rinse the beans with fresh cool water, draining well. Set aside. Add oil to the Instant Pot and press the SAUTE button. When display reads "Hot" add the onion, bell pepper, and jalapeno. Cook, stirring, for 2 to 3 minutes, or until onion and bell pepper are beginning to soften. Add garlic and cook for an additional minute then press CANCEL. Add soaked beans, broth, tomato sauce, chili powder, yellow mustard, cumin, oregano, black pepper, and the bay leaves. Stir well to combine. Lock the lid in place, and turn the vent at the top to the SEALED position. 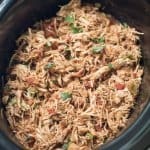 Set Instant Pot to MANUAL and cook for 25 minutes. When time is up, allow the steam pressure to naturally release which should take 15 to 20 minutes. After the natural release, move vent on top to the RELEASE position to allow any remaining pressure to release before removing the lid. Taste and season with salt as desired. 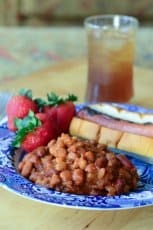 For saucy beans like the beans pictured in this post, use 3-1/2 cups broth. For a slightly thicker texture use 3 cups broth. 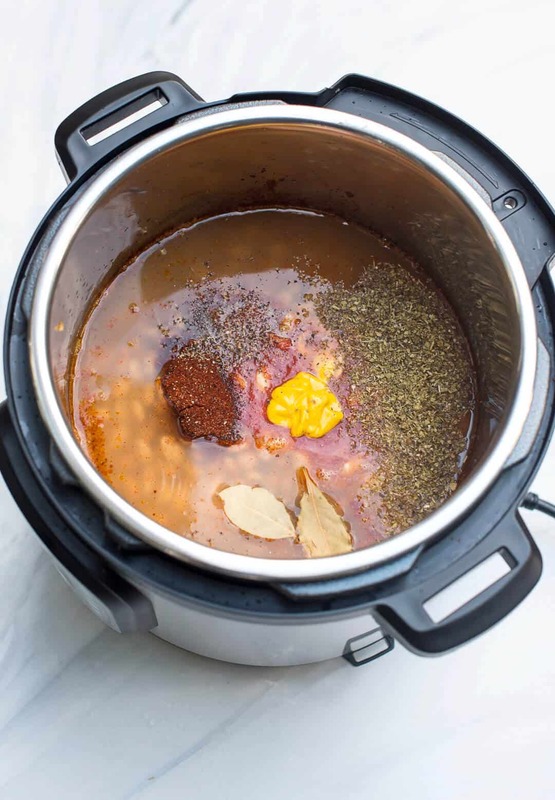 Cooking time stated does not include the time it will take for the Instant Pot to reach full pressure (approximately 15 minutes) and the natural release time (approximately 20 minutes). So, what does this thing do that a pot on the stove or a slow cooker doesn’t? I think I’m missing something! Great recipe, tho! It is a pressure cooker. It cooks things faster. Not only does it cook things much more quickly it also retained a higher amount of vitamins and minerals … not lost during cooking. Oh, it does so much! Pressure cooking is just one of the many cooking functions this one appliance is capable of. 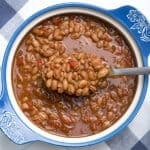 For this particular recipe, it cooks dry beans without you having to babysit a pot on the stove in about half the time it takes on the stove or in the oven. It’s a hands-off method. The unit automatically shifts to the Keep Warm setting when the cooking cycle is complete so you can go about your business and the dish will be ready for you when you are ready for it. 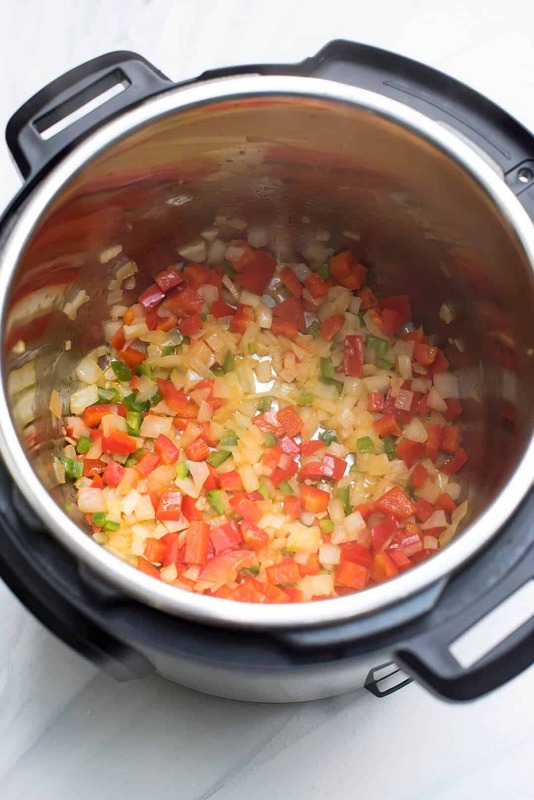 I wrote a separate post detailing all of this and more here – Instant Pot Tips for Beginners. Half the time? More like 15% to 20% of the time. Or less. I’ve cooked beans many times in a crock pot. They take ten to sixteen hours, depending on freshness. With the IP, it’s about 70 minutes, and it’s consistent. That’s a huge difference. I can get home from work, put a pound of beans in the Instant Pot, and have them with dinner that night. Not possible with a regular pot or a crock pot. Wow. 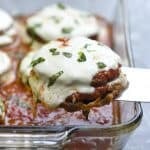 Just made this recipe and it is sooooo good. I am practicing WFPB diet and so I omitted the oil. I salted the veg in some vegetable broth. 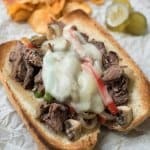 This recipe is going into permanent rotation at my house. That’s so great to hear, Josie! I was so impressed with the result and will definitely be making lots and lots of beans in my Instant Pot. Did you use the manual high or low pressure setting? You should cook them on the High setting, Lauren. The IP will default automatically to High so once you press MANUAL, all you’ll need to do is adjust the cooking time and you’re good to go. Wanted the like this, but honestly I would not make it again (sorry!). Follow another review and added an onion soup mix to try to help with taste (it helped some but still not the best). I’m sorry the recipe didn’t work out for you, Amanda. It sounds like several things may have gone wrong. I would not recommend straying from the original seasonings listed in the recipe. Adding a packet of onion soup mix makes this a completely different recipe. Also, based on your comments I wonder if you may have skipped the step of pre-soaking the beans. This will speed up the cooking time significantly which I spoke about in the post. There could also be an issue if you were using beans that have been sitting in your pantry too long. When made as directed there is plenty of sauce (as shown). I made these without pre-soaking and they turned out amazing! I bumped up the water to 5.5 cups to make up for not soaking. From one Valerie to another, this was very good!! My beans still undercooked after soaking overnight and cooking 25 minutes. Disappointed. Hi Louann. You can always add a little more time than the recipe states however soaked beans should cook up to a nice texture with a 25 minute cook time. Take a look at the Pressure Cooking Timetable published by the makers of the Instant Pot for more information http://instantpot.us/cooking-time/dry-beans-legume-and-lentils/. Also, please be sure you are using fresh beans as older beans can become dehydrated and not soften well during the cooking process. I made this today, but I was wary of the long cooking time. My instant pot book says soaked pintos should take only 4-6 minutes. Changes I made: I used a fajita seasoning from my fav spice store instead of the cumin and chili powder. After sautéing the veggies in veg broth (not oil), I reduced the IP cooking time to 8 minutes, using the “natural” release of about 20 minutes. The beans were great (well cooked but not mushy)! I would add a reminder to remove the bay leaves at the end. I will definitely make this again! Thanks for sharing the recipe. How many cups of dried beans make a pound? Made the beans today and they were delicious! I had to cook them an extra 5 minutes but it wasn’t a big deal. Thanks for sharing this wonderful recipe! I know you recommend not doubling the recipe but do you think it’s safe to do so with an 8qt instant pot? Also, I’d like to make ahead for a party so how long can I safely keep them in the fridge? Hi Lisa. I did these in my 6 quart pot so I don’t think it would be wise to try doubling for an 8 quart. If I was making them to serve to guests, I don’t think I’d want them to be made more than a day in advance. This is a great recipe and very straight forward. 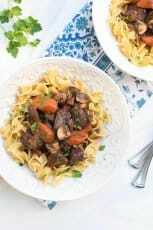 I made it today in 6-qt instant pot. I combined almost of your spices and veggies (garlic, onions and frozen trio of peppers) plus added bacon (it’s never wrong), and substituted a tsp of dry mustard (on hand) and some left-over frozen Rao Marinara (on hand) for a can of sauce. I also used 4.5 cups of water w/3 tsp vegan Better Than Boullion base, and an extra 2 tbsp Spice Island chili spices b/c past experience has taught me I always need more Mexican spices than any recipe calls for. It turned out delicious and was so easy to make. I recommend soaking the beans, also, for digestive/health benefits. Even canned beans are not soaked. I put them in a metal bowl covered with cold water and a lid then ignored them for 20 hrs until I was ready to rinse and sort. I bought the cheapest Walmart GV brand 2 days earlier so I decided to cook them for longer. 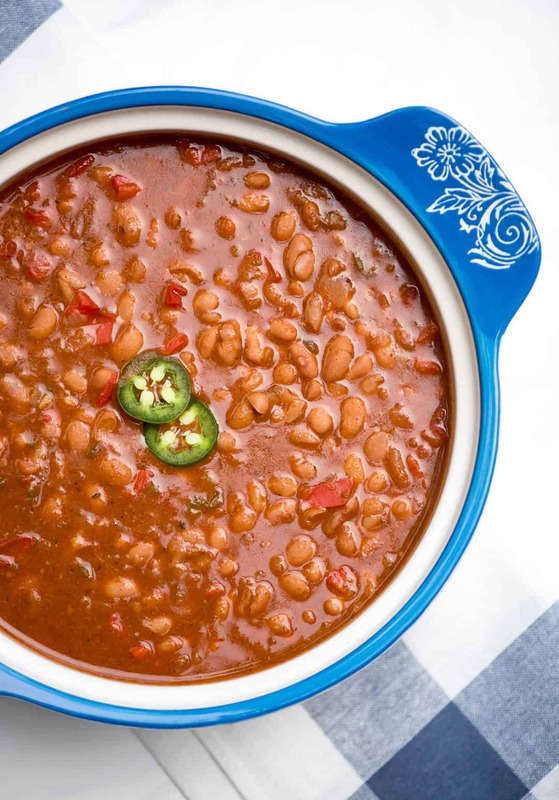 FYI- LemonadeMom on YouTube recommends using 3 TBSP of any pinto seasoning, 1 C unsoaked beans: 5 C water or broth in the Instant Pot cooked x 45 min on high pressure followed by a natural steam release after 10 min in 6 QT– she said they’re perfect every time. My point is– do your own research, consider your own past experiences, and go from there. I’m conservative w/time frames for any food that will not be ruined by overcooking or too much steam/H2O. I’ve had to go back and add like 30 min total specifically for large amounts of potatoes; a homemade cheesecake. If you have to add time, it’s not a big deal and overcooking is just a teachable moment. It’s just food. Yes, I always soak dry beans overnight and feel it yields the best result. There is no need to refrigerate them while they are soaking but I’m sure they will turn out just fine. Thank you for this recipe. I LOVE it and will make it many more times, I hope. I halved the recipe because I’m using the 3 quart IP. Used red pepper flakes instead of the jalapeno and used 8 oz tomato sauce because I had some homemade to use up. My dried beans must have been fresh because they were soft after 15 minutes in the IP (I had presoaked them in the IP for 3 minutes). They are so delicious and healthy. I don’t think I have ever left a comment on any cooking site before but had to chime in. I have a little baby Instapot, and I used 4 cups of pre-soaked beans and 3 1/2 cups of vegetable broth. I sauteed the vegetables in a little bacon fat for flavor and added epazote. When they were done, I put them in a cast iron pan with some butter, smushed them with a potato masher and then used the immersion blender to get them nice and creamy, adding some of the pot liquid along the way. They were delicious! Thanks for a well written, informative article. Amazing! I had everything but a jalapeño so I used acanned diced jalapeños. Oh Lawdy, it’s extra hot but it’s delicious. 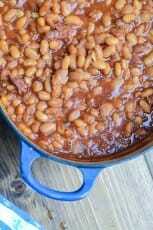 I soaked my beans for about 5 hours, cooked 40 minutes, natural released for about 20 minutes. Perfect. I made the recipe with every ingredient listed. I can just imagine how good they would be with added ground beef for chili and beans. 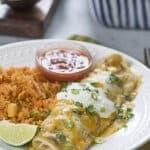 Can I use mild picante sauce instead of tomato sauce and jalapeno? ****** Thanks — just excellent. I used 1.5 times spices and onions/garlic because that’s the way we roll… 🙂 Turned out amazing. Ooh just made this and yum! Adding fresh lime juice and chopped cilantro at the end took it to a whole different dimension. Thank you for a great recipe. 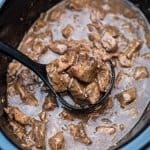 Should I halve everything while using a 3qt instant pot? I’ve not tested this recipe in a smaller Instant Pot but I would think that should work. Hi. I made these with Ecuadorian red beans that were for sale at a market that attracts a South American clientele. Followed your recipe with some small changes. I substituted 8 oz of beer for part of the broth and I added some chipotle peppers in sauce. I cooked it for 30 minutes. Also added a bit of a spice mixture that I basically add to anything that doesn’t run away, a sort of an Emeril’s combo which has a fair amount of cayenne. The beans were just fantastic! So thanks! I am making this now, with a new IP-Duo 7 in 1, and it does not have a MANUAL setting. I chose the Chili/Bean setting and the cook is underway. For future though, what is the correct button? Would it just be PRESSURE COOK? Hi Teri. I think you’ll be fine with the Chili/Bean setting. I don’t own the 7 in 1 model but I believe the Manual and Pressure Cook settings are one in the same. Manual allows you to manually set the pressure cooking time before the natural release cycle begins so I prefer it over the programmed settings since it allows more control. Fantastic! Yes, beans freeze very well. So happy you loved them! New to an IP and didn’t soak the beans but picked up pinto beans that day from the store. Followed the recipe except for no bell pepper. Also due to not having the beans we sautéed the hamburger and onions outside of the IP. Saved some time and it came out great. Thank you for the research. Recipe definitely a keeper. I did add/saute 1/2 to 3/4 pound of bacon before adding onion, bell pepper, etc., then followed recipe exactly. Excellent results!! Thank you!! Followed recipe except for added diced bacon and sautéed with vegetables. Delicious beans! will make these again and again.! Thank you VB! could you add sausage to this? 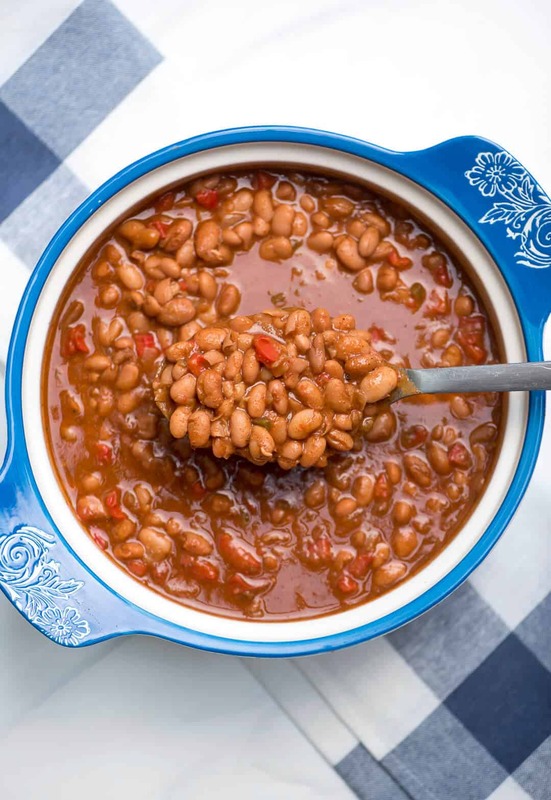 I’ve been making pinto beans in my 6 qt IP for years and this is hands down the best recipe yet. Did not deviate from the recipe and everything turned out perfectly wonderful. Hi Valerie- thanks for sharing. I’ve been making many batches of IP Pintos but none like yours. Mustard? If one more recipe has mustard!!! I followed yours almost exactly because I wanted to, except yesterday I made a huge bowl of pico de gallo (with cilantro) before my tomatoes went soft so I subbed your onion, garlic, bell pepper, and tomato for my PdG. I followed the recipe everywhere else including 6 hour soak and this is my new favorite. Thank you!! !